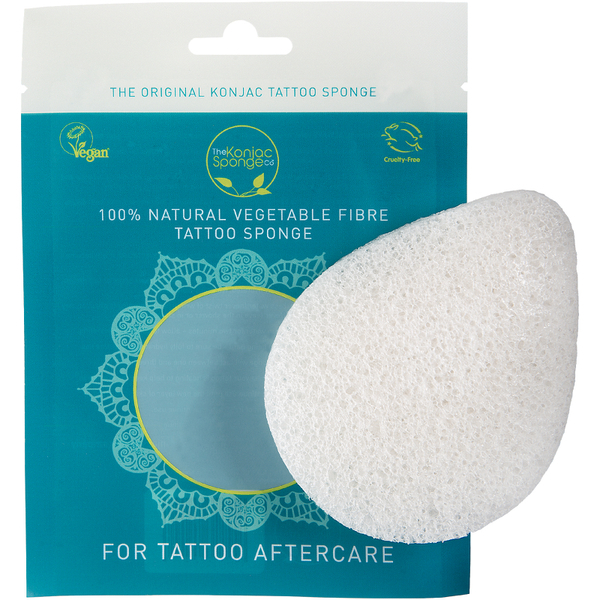 The Konjac Sponge Company presents the Tattoo Sponge, a 100% naturally sustainable product specifically designed for cleaning your new tattoos without causing irritation or damage. Delicately handmade purely from moisture-rich Konjac plant fibres and Volcanic Water, the innovative biodegradable sponge has a unique net-like structure that turns silky soft when wet and works to eliminates dirt, blood and plasma whilst soothing the area and helping to prevent scabs forming. It won’t strip skin of natural oils, and aims to soothe and nourish the delicate new skin that forms without causing any further irritation. Konjac is a natural wonder – it’s been used in Southern Asia for over 1,500 years as a medicinal and beauty treatment, and it is alkaline based thus balances any acidity in skin and restores optimum pH levels. Lasting for up to 3 months, the perfume-free sponge is super hygienic and easily sterilised between uses by popping into boiling water for a couple of minutes. Make sure your new masterpiece looks its best and keep skin in pristine condition with this all-natural cleansing alternative. Use - Use the sponge once or twice a day during the first couple of days of healing (prior to any scabbing or peeling). Sterilise in between use by just boiling in water for two minutes.